NASA's Upper Atmosphere Research Satellite, or UARS, is expected to re-enter Earth's atmosphere Sept. 23, plus or minus a day. NASA's UARS satellite, launched in 1991 from the Space Shuttle, was the first multi-instrumented satellite to observe numerous chemical constituents of the atmosphere with a goal of better understanding atmospheric photochemistry and transport. 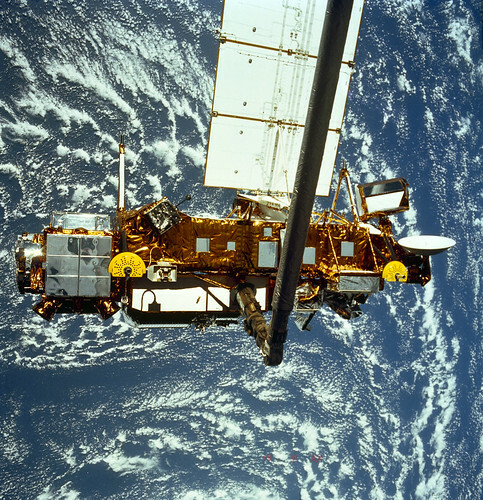 About this image: This STS-48 onboard photo is of the Upper Atmosphere Research Satellite (UARS) in the grasp of the RMS (Remote Manipulator System) during deployment, September 1991. UARS gathers data related to the chemistry, dynamics, and energy of the ozone layer. UARS data is used to study energy input, stratospheric photo chemistry, and upper atmospheric circulation. UARS helps us understand and predict how the nitrogen and chlorine cycles, and the nitrous oxides and halo carbons which maintain them, relate to the ozone balance. It also observes diurnal variations in short-lived stratospheric chemical species important to ozone destruction. Data from UARS enables scientists to study ozone depletion in the upper atmosphere.